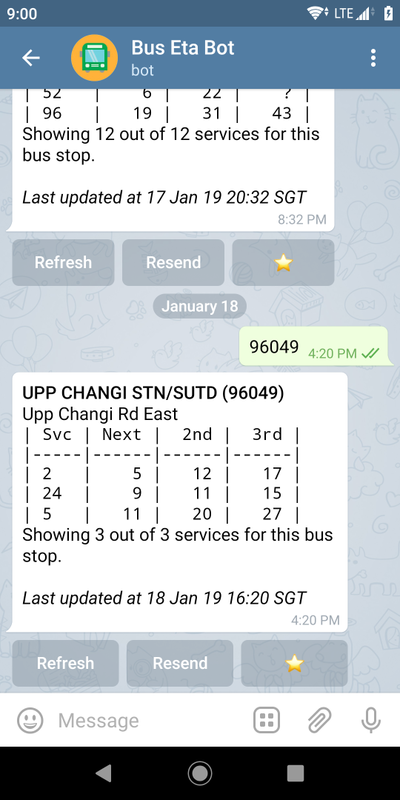 Bus Eta Bot is a Telegram bot for getting bus arrival times from the LTA DataMall API. It is written in Go and hosted on the App Engine standard environment for Go. Because Bus Eta Bot uses the App Engine specific appengine/urlfetch and appengine/datastore packages, outgoing HTTP requests and Cloud Datastore operations are automatically traced and can be viewed on the Cloud Console. In the App Engine Go 1.11 Standard Environment, the standard library net/http HTTP client and generic Google Cloud client libraries can be used instead of their App Engine-specific counterparts. While doing so eliminates some inconveniences such as having to create a new HTTP client per request, it also loses the automatic Stackdriver Trace instrumentation. Here, I’ve added a trace for the InMemoryBusStopRepository.Nearby method in my code. This method finds bus stops within a certain distance of a certain location by looping through a list of bus stops in memory, and I wanted to compare its performance to another implementation which used the App Engine Search API. // Create and register a OpenCensus Stackdriver Trace exporter. The provided stackdriver.Options can be empty because there’s no need to provide application credentials inside App Engine. Depending on the amount of traffic you’re expecting, you can also configure OpenCensus to always sample traces to see results immediately (otherwise, not all traces will be recorded). The StartSpan method in the go.opencensus.io/trace package will start a new child span if its context.Context argument already contains a span. However, because we’re integrating with the existing non-OpenCensus instrumentation, we can’t simply do this. Instead, we need to create a parent span based on the information contained in the X-Cloud-Trace-Context header passed to an App Engine request. You will be able to see your created spans together with the rest of the App Engine spans in Stackdriver Trace after the request is complete. // newContext creates a new context from an incoming App Engine request to be passed through the application. // parentSpanFromContext extracts a *trace.SpanContext from ctx.